Thanksgiving Day P saw the Macy’s Day Parade. The one thing she got from all the floats and people were the dancers. Then she saw a cartoon with ballerinas and that was it; she wanted dance classes. 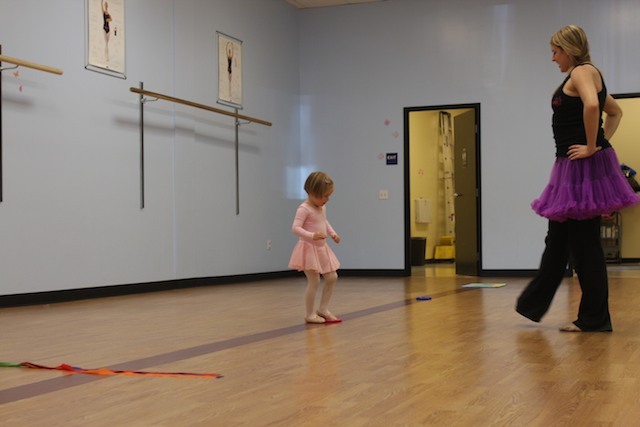 Two days ago I took her to get ballet clothes and today she took her first class. She was in heaven. I know she was in heaven because she followed the teacher and peers so intently. It was really lovely to watch her so happy in her element. As a former professional athlete, I can’t help but watch her intently myself to see if I can pick up on her natural abilities. There are the things you can see a person will thrive with. Other aspects may just need a little work and others the individual will always struggle with. I can still see P has athleticism. I am starting to see she’s not going to be naturally flexible. I will have to encourage yoga or dance classes to enhance her flexibility throughout her childhood. Then there are the emotional talents. I can see P is competitive and likes to be the first. I like that about her. I think my job will be to gear these traits so they continue to be positive attributes. I never had the opportunity to take ballet or any kind of dance class. This whole experience has been wonderful for me. I’m living through her right now, from the clothes to learning each term or step, I’m right there in heaven as well.